Some Neanderthals were probably redheads, a DNA study has shown. A team reports in the journal Science that it extracted DNA from the remains of two Neanderthals and retrieved part of an important gene called MC1R. In modern people, a change - or mutation - in this gene causes red hair, but, until now, no one knew what hair colour our extinct relatives had. 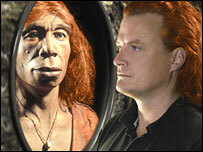 By analysing a version of the gene in Neanderthals, the scientists found that they also have sported fiery locks. "We found a variant of MC1R in Neanderthals which is not present in modern humans, but which causes an effect on the hair similar to that seen in modern redheads," said lead author Carles Lalueza-Fox, assistant professor in genetics at the University of Barcelona, Spain. Though once thought to have been our ancestors, the Neanderthals are now considered by many to be an evolutionary dead end. They appear in the fossil record about 400,000 years ago and, at their peak, these squat, physically powerful hunters dominated a wide range spanning Britain and Iberia in the west, Israel in the south and Siberia in the east. Our own species, Homo sapiens, evolved in Africa, and displaced the Neanderthals ( Homo neanderthalensis) after entering Europe about 40,000 years ago. 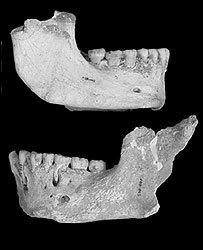 The last known evidence of Neanderthals comes from Gibraltar and is dated to between 28,000 and 24,000 years ago. Until relatively recently, scientists could turn only to fossils in order to learn what Neanderthals were like. But recent pioneering work has allowed scientists to study DNA from their bones. Genetics could shed light on aspects of Neanderthal biology that are not preserved in fossils. These include external appearance - such as hair, skin and eye colour - cell chemistry and perhaps even cognitive ability. This will help scientists address key questions, such as why we and not they inherited the Earth. Genes for skin colour and hair colour are obvious early targets for scientists engaged in these efforts. In modern people from equatorial areas, dark skin and hair is needed to guard against skin cancer caused by strong UV radiation from the Sun. By contrast, pale skin - along with red or blond hair - appears to be the product of lower levels of sunlight present in areas further from the equator such as Europe. "Once you go out of Africa, the selective pressure from UV radiation disappears. So any mutation that falls into the MC1R gene is allowed to survive and spread through a population," said Dr Lalueza-Fox, speaking at the Climate and Humans conference in Murcia, Spain. But people with fair skin are able to generate more vitamin D, which may have given them an evolutionary advantage in northern regions. The latest research suggests that similar adaptations were evolved independently by Neanderthals and modern Europeans in response to similar environmental circumstances. All humans carry the MC1R gene, but modern redheads possess an altered, or mutated, version of it. This rare variant does not work as effectively as more common forms of the gene. This loss of function alters the chemistry of the cell, producing red hair and pale skin. In the latest study, the authors retrieved fragments of the MC1R sequence from Neanderthal bones found at Monte Lessini in Italy and from remains unearthed at El Sidron cave in northern Spain. DNA is notoriously difficult to obtain from very old specimens such as these. "This was a bit like finding a needle in a genomic haystack. I couldn't believe we found it the first time. I asked my friends to repeat the results. 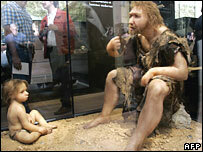 Eventually the variant was found in two separate Neanderthals in three different labs," said Dr Lalueza-Fox. The researchers found that Neanderthals carried a unique variant of the gene not present in modern humans. In order to test what effect it had on hair and skin colour, the researchers inserted the Neanderthal variant into a human cell called a melanocyte. Melanocytes produce the dark pigment called melanin which gives skin, hair and eyes their colour. The researchers saw the same loss of function in the Neanderthal form of MC1R as they did in modern variants of the gene which produce red hair. "In Neanderthals, there was probably the whole range of hair colour we see today in modern European populations, from dark to blond right through to red," Dr Lalueza-Fox told the BBC News website. To Dr Lalueza-Fox, the observation that the Neanderthal version of the gene is not found in modern humans suggests they did not interbreed with each other, as some scientists have proposed. Dr Clive Finlayson, director of the Gibraltar Museum, commented: "It's extremely interesting - it makes us understand a bit more about who the Neanderthals were. "It suggests there may be a propensity towards the reduction of melanin in populations away from the tropics. If the Neanderthal and modern variants are different, it may be a good example of parallel, or convergent evolution - a similar evolutionary response to the same situation." "Neanderthal genetics is going to give us a lot more information. This is the tip of the iceberg." In a separate study, published in the journal Current Biology, Dr Lalueza-Fox and colleagues extracted the DNA sequence for a gene called FoxP2 from Neanderthals. Modern people have several changes in this gene that are absent in our relatives the chimpanzees. This suggests that FoxP2 may have been an important gene in the evolution of language, something which separates us from the great apes. The researchers found that Neanderthals shared these key mutations in FoxP2 with modern humans, suggesting they had some of the prerequisites for language and speech. An ongoing project to sequence the entire Neanderthal genome was recently hit by claims by a group of researchers that samples could be contaminated with modern human DNA.